The track follows the road which connects Galbiate to Consonno. We decided to take this track as a traning for more future challenging walks. After arriving by car in Villa Vergano, a small district of Galbiate, you can park in via Roma, as parking places are very few in this area. This parking will be clearly visible from the main road leading to the village. As soon as you have left your car here, turn right and follow the road for a short stretch of the provincial 58 to via Don Minzoni. From via Don Minzoni you will come to the starting point of the road to Consonno, the first stretch consists of a sharp uphill ascent, but as it is an asphalt path, you won’t make so much effort. You may go on with this road for a hundred meters and pass the latest houses of Villa Vergano, finally you come to an area, which is characterized by wide meadows for forage. After the first bend, the uphill walk becomes more gentle and the most interesting view, looking to the left, will be given by Lake Annone and in the distance by Lake Pusiano. Fields of ornamental plants and some fruit trees will characterize this second segment. The second section comes to a stop near a farmhouse, in which point the path gently turns right and enters into the bush, here you start turning around the hill. The road begins to be more rough and it is alternately smooth in some points and uphill in some others. After the ascent, looking through the trees, you can see Lake Garlate and the town of Olginate. Here we have finally reached the last stretch of the route, the descent to Consonno, about 2.5km and 40 minutes after the start, is easy and sharp. 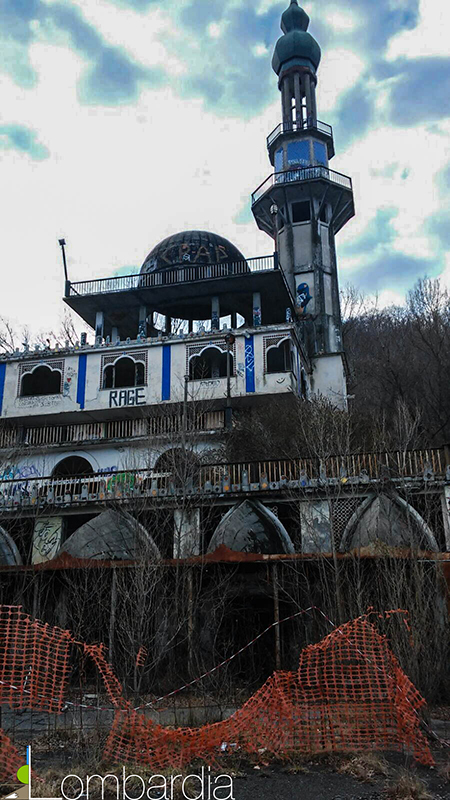 Once you find yourself nearby Consonno, you see the minaret, which stands out above the bush as a point of reference. In this point, the route enters the village from the main road with the bulk of the minaret building on the left and an old truck, wreck of the past. The route ends (3.55km) 1 hour after the start. We suggest you not to make the journey when visibility is poor because there is no lightening along the path and the cars and motorcycles, despite the road is not in very good condition, pass by at high speed.